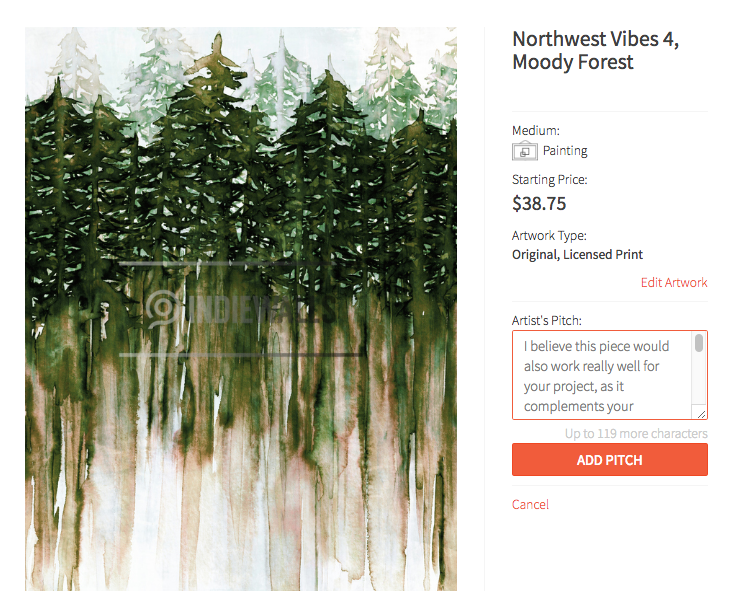 Art-Ed: What Makes a Good Pitch? Pitching artwork is at the core of the Indiewalls artist experience. The opportunity to select and pitch your art directly to the eyes of buyers and Indiewalls’ curators is a part of what makes Indiewalls a unique platform. Pitching opens you up to more selling opportunities and boosts your visibility to our clients. We believe that this approach offers you, the artist, heightened career control and transparency. As part of an ongoing effort to produce informative content that helps our users, we’ve pulled together tips to strengthen your Indiewalls pitches. The most important part of pitching is presenting work that aligns with the requirements (aesthetic, budgetary, timeline, etc.) of a project. The strongest pitches are artworks or commission concepts that are within the client's price range, available by the due date, and visually on par with the client's description and inspiration images. Does the timeline work for my schedule? Does my artwork fall within budget? Does my work fit the aesthetics? Am I comfortable with the required mediums and/or image licensing for this project? Don’t waste time pitching to projects for which you don’t feel you’re a good fit. Instead put that energy towards pushing your own boundaries in custom commission calls. You are initially allowed two pitches per project. Once a buyer has favorited one of your pitches, you can pitch indefinitely. Please note that if a client favorites your work to a project outside of the pitch process, that doesn’t count toward your pitch limit. We suggest pitching one work and then waiting to see how the client responds. If your pitch is favorited, you now have the option to pitch an unlimited amount of work. If they hid your first pitch, we recommend analyzing other works they rated. This will allow you to tailor your second pitch to more clearly fit their needs. Commercial art sales are different from those of the traditional blue chip gallery. Often times interior designers will fall in love with artworks but want to incorporate changes, either by requesting modifications to licensed prints or by commissioning similar artworks. We always allow artists to opt in and out of deals, but flexibility in aesthetic considerations like coloration and composition can sometimes seal the deal. While you’re the commander-in-chief of your artwork, incorporating feedback can be a great means of pushing your creativity in new directions. The pitch description and supplemental images aren’t required and buyers don’t necessarily see them, but they can help to clarify your intent or thought behind why this piece is a good fit. Pitch descriptions are most helpful when they are 1-2 simple sentences that communicate why your work relates to the project description. You may want to include specific details about the artwork medium, proposed commission direction, and image customization. Supplemental images are intended to show additional images of existing pieces or to enhance a custom commission pitch. They allow you to provide further context. This is especially helpful if you want to show a 3D piece from multiple angles or highlight details from an original work. This helps give the client a better sense of what your work is like in person. A strong commission pitch relies on relevant visuals and a clear description. Start by pitching a comparable existing/past work in your portfolio as the main image. (Don’t be shy to upload past work that isn’t on Indiewalls. Past pieces can be pitchable inventory.) Then use the supplemental images to show inspiration images or other past work. You can then utilize the description to explain the pitched images, how you would approach this specific commission, and what previous experience prepares you for this job. This will be the client’s first foray into your idea so don’t be afraid to be thorough, but bear in mind that the pitch is the first part of the process and only once the buyer has chosen an artist should concepts be further developed. 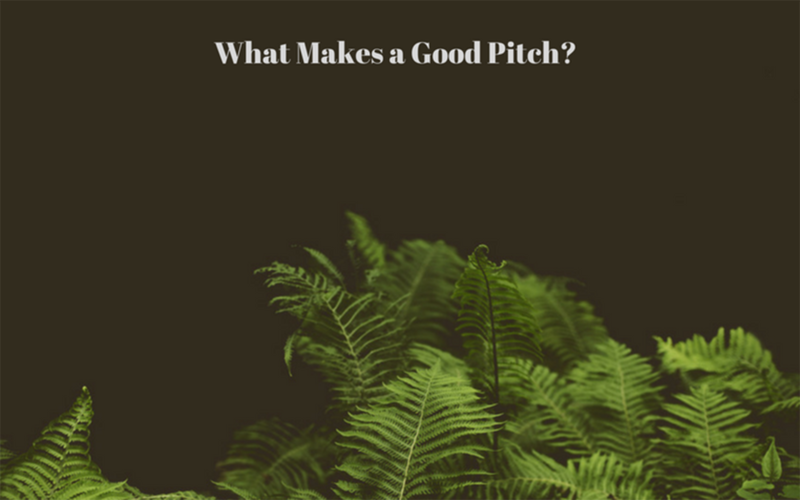 Pitching connects you with buyers and curators and is a unique opportunity to get eyes on your work. We understand that sometimes pitching my feel elusive and frustrating, but pitching is your first point of entry to a buyer or curator. Pitches do not guarantee a sale, but pitching ensures your work will be seen by both and Indiewalls curator and potential client. If you pitched, you are on our radar and thus one step closer to securing a project. Feel free to leave feedback and thoughts in the comments. Artwork by Julia Di Sano. Cover artwork by Tina Crespo.